This house has it all! 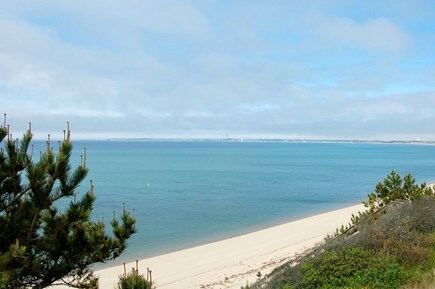 Overlooking Cape Cod Bay to the tip of Provincetown ... the Cape Beach House has been renovated to enhance its charm and includes all the amenities you will want for your vacation needs. This 3 bedroom house features a free-standing brick fireplace facing the living room on one side and a full kitchen on other side. There is an open living/dining room, wood flooring upstairs, sweeping water views from the kitchen and living room and water views from other rooms. The house offers reversed living for stunning water views. Moderate beach stairs were created new in 2015. 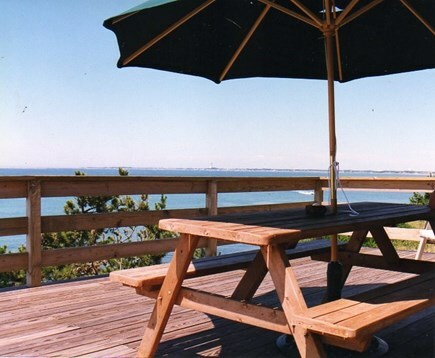 The deck is large with a picnic table, shade umbrella, lounge chairs and gas grill. 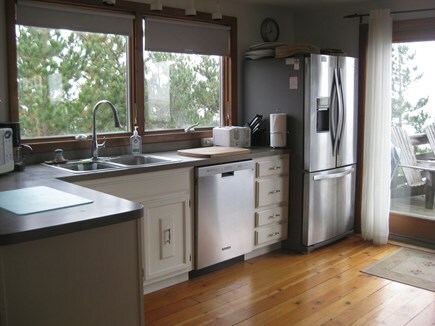 There is central vacuum system, high speed wireless internet service, cable TV, ipod dock and much more. 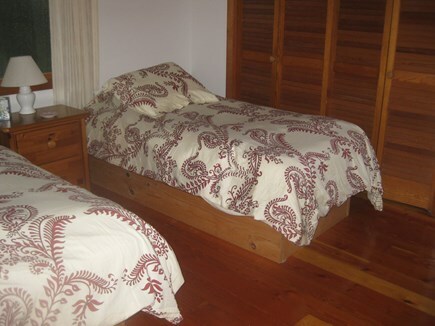 The house is well maintained, clean and very comfortable. It very well stocked for all your vacation needs including beach chairs, a kayak and some beach toys, and boogie boards. 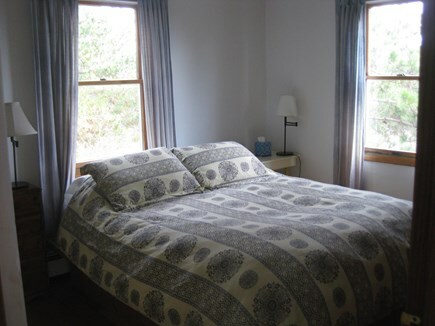 Sleeping 6 max, including children, in 3 bedrooms with comfortable mattresses. Sheets and towels can be provided for a charge of $75, but if only a couple is renting the house without other guests, there is no charge. We provide many green cleaning products. You will love this house! Additional availability info: there is a two week minimum in July and August unless making an exception . Additional pricing info: Nov. and Dec, 4 night min. $325. 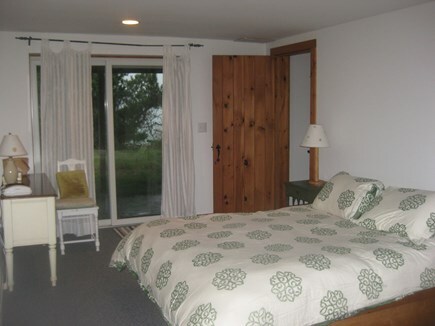 and $300 per night .Thanksgiving and Christmas/New Years is weekly, State and local taxes of 12.45% will apply. There is a first floor bedroom and bathroom/shower. Most wonderful, peaceful holiday ever!!! Fabulous house with fabulous water views! Despite some rain, we had a great week at the Beach House! The view was amazing and the stairs down to the beach were easy, even with a toddler. The house was very "homey" and very comfortable to settle right in. 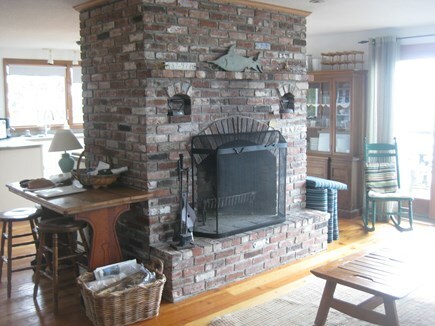 Over the last 15 years or so we (older couple) have rented numerous houses on Cape Cod and the Maine coast. 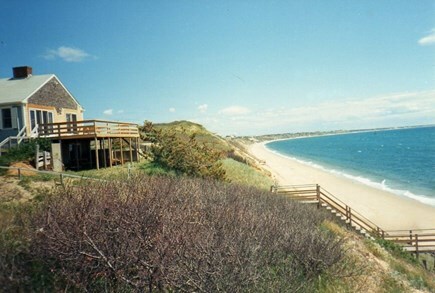 But Janet’s waterfront beach house in Truro (sitting on a high sandy bluff overlooking a wide beach) is by far our favorite on Cape Cod. The water view from the deck both towards P’Town and out to the open sea was spectacular. The sunny and pleasantly cool weather for our mid-November visit was ideal for sitting on the deck and reading in the warmth of the afternoon sun, while listening to the sounds of the surf and sea gulls overhead. The quiet and private setting was so conducive to thoughtful introspection, as well as meaningful conversations with friends – not only on the deck, but while strolling leisurely on the beach while our dog played freely off-leash. At night the warm glow from the fireplace added to the ambiance of tranquility in this private place. An added bonus to such a terrific place was Janet’s gracious hospitality and thoughtfulness. Not only was the house well stocked with everything one could need in a vacation house, but things were well maintained and up-to-date – not only was the kitchen well stocked with appropriate dishes and cooking utensils, but they were also well maintained and up-to-date (the cutlery was actually sharp and usable, and there was a rich assortment of spices). All in all, Janet’s house is an excellent combination of spectacular environment with comfortable and well-maintained facilities and amenities. Highly recommended! I have lived in Truro for 30 years and raised my family here. 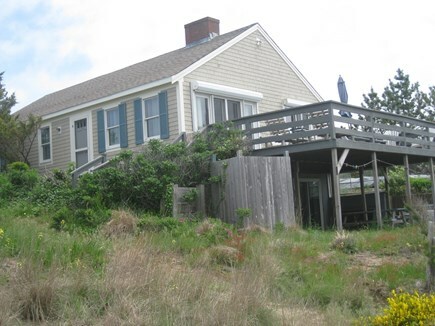 When I bought this house as a rental in the year 2000, it was from a local fisherman's wife . 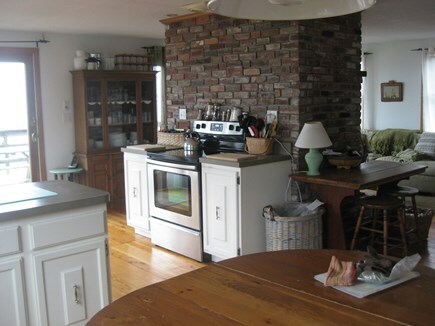 I renovated the house to be more contemporary while keeping the ''Old Cape Cod'' charm. Most all the artwork in the house was found in the cellar, which has since been renovated to be a part of the house. It was quite a transformation to open up the rooms, change stairways, flooring, build a deck, and to maximize the water views. It was quite the transformation to become my cozy dream house on the water. 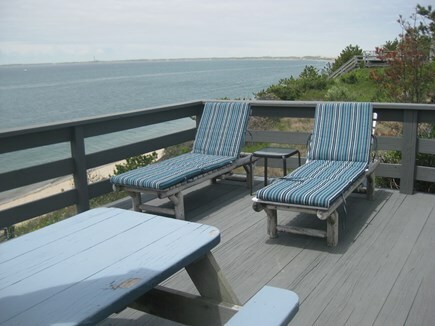 I want my guests to feel like the Beach House is their second home so that they can make Cape Cod memories that will last a lifetime . 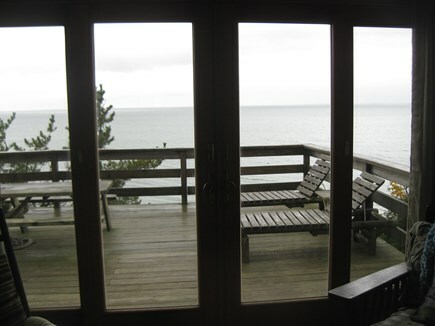 This Waterfront Beach House has been in my family and has been my joy to rent for 15 years. I have many families and couples that return every year for many years and some form the very beginnings. I pride myself on offering a clean house that is well maintained and is well stocked for all your vacation needs with all cleaning supplies , paper goods , dish towels , spices , basics. Also there are beach chairs provided, a kayak and more . I make sure all bedding is just washed for your stay including quilts. The decor is a bit of pottery barn style with some antiques that feels like Cape Cod with a contemporary mix. 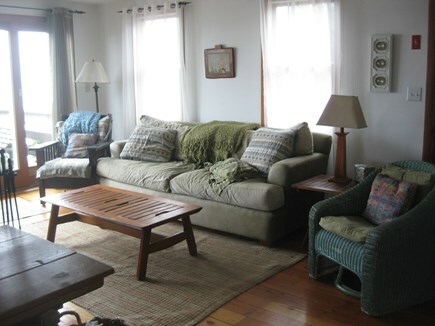 I am sure you will feel at home in minutes in a relaxed style with Cape Cod charm. Sitting out on the deck feels like you are on a boat . 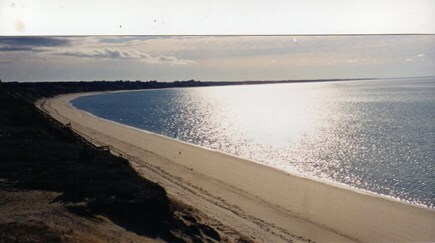 The beach is private and quiet with no public access. You can walk in either direction as far as you like even with pets closer to the water . The sun sets just in front of your view over Cape Cod Bay and you can see the very tip of the Cape to Long Point light house .The bayside is clean and swimmable with sandy beaches . The magnificent ocean side is just 5 minutes away by car, and there are many options to enjoy both sides . Truro is a small town with many hidden treasures. You can go to the winery, taste wine and have lunch on the green lawn from a delicious food truck. We have only a few local small food stores, a farm stand, a fish market, a large kitchen store / spice shop , and a few very decent restaurants . Not that many, but what there is, is good. There is even a local museum. Truro has a golf course on the ocean. What Truro is most famous for is its gorgeous, vast, sandy beaches both bayside and ocean side. Truro has a couple of freshwater ponds and endless smaller forests to explore in the National Seashore, which makes up of most of the land in Truro and keeps us close to nature, quiet and special.